This is the face of hope…of courage…of faith. This is my beautiful, then 4 year old daughter, Janet. Until this day, she had never had a hair cut in her life. Cancer treatment would take her hair away, and eventually her life. But, the smile you see here – it never really faded. She had a smile that could melt an iceberg. This day in history. On some calendars, it is merely but a day. On mine, it will forever mark the day (four years ago today, if you’re reading this in 2017) – that our lives changed forever. 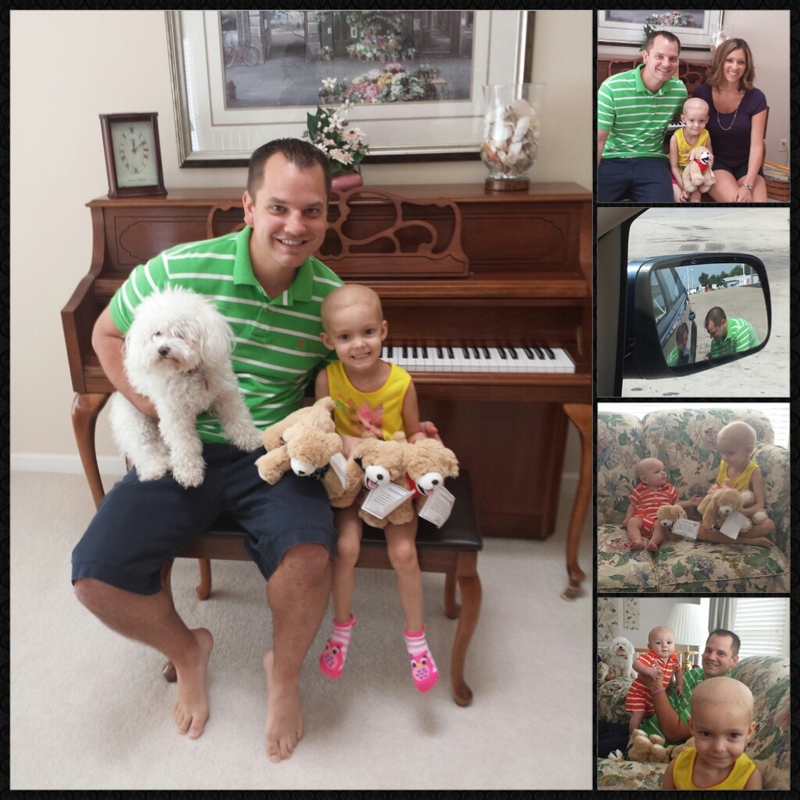 It was this day, 2013, that our sweet little Janet was diagnosed with a brain tumor. That was the day that life as we knew it – it would never be the same. The normal we once knew, would never be heard from, or seen again. From that day forward, however, we would also learn an indescribable love. Yes, this journey would become not a sprint, but a marathon. A journey of epic proportions. A journey so painful, it is hard to breathe some days…but so full of love. It would be the beginning of our journey fighting childhood cancer alongside Janet. She was so very loved, and never alone — and knew both of these things to be truth. With all the love in the world, it’s still a journey marked by intense pain and heartbreak. This day, 2013, she was diagnosed with a brain tumor…and three years later, she would breath her last breath this side of Heaven. Friends, I hate the fact that this is our reality. It shatters my heart, and I wish with everything I am that life wasn’t this way. But, it is…and here we are. Continuing to breath, and continuing to have a heart that beats. I made some statements and promises to Janet just before she died. I told her that we were going to miss her like crazy, like there’s no tomorrow…and that it would hurt when she was gone, but that we would be okay, because we’d be together. I did tell her that we would ALWAYS #RememberTheLove. And, that is a promise I will never break. For those of you following, and who share love and support – and also prayers, it is with heartfelt gratitude that I say thank you. Please, please don’t ever stop. Something I continue to talk about is not being alone. This journey is so much easier to walk through knowing there are others who love our four year old (and us) and care. From the very beginning, I determined this is nothing I was willing to do alone, or to allow her to do alone. As such, we were blessed to be able to connect with an organization that reaches out to cancer patients of all ages. This organization, Phil’s Friends has been instrumental in blessing SO many people, or family included. Phil, who started Phils Friends after his own fight with cancer not once, but twice, has a heart of gold. His testimony is such an inspiration to us. God’s love and peace was so much a part of his healing, of his story, he started this organization with the hopes of reaching others who are struggling with this. His faith was strengthened through this process, and he aims to share the same strength and hope with anyone through this organization. A few weeks ago, Janet received a care package from Phils Friends. I posted pictures at the time. It came at the perfect timing. In the times since, we’ve aligned with this organization to help them share hope in any way possible. They have brought Janet (and countless others) so many smiles. Smiles do a body good!! Anyway, that said – Phil was in town with his family this past weekend. Janet and I had the honor of meeting him and his family. There were hugs and many smiles. In the picture, you’ll see a semi-funny picture not seemingly related. It just shows Phil’s heart. My air was low in my tire, so he insisted that he help me – as he wanted to make sure we were safe. So, he helped out. So, I had to take a picture. Anyway, Phil actually brought a special care package for Janet to give to one of her special new friends at the hospital. What better time, cause her next inpatient stay starts tomorrow! I would consider it an honor if you would repost and/or share this with anyone in your sphere of influence. Go to their page, like it, and let them know we sent you! More than that, let others know about them. You can find out more at their website as well. If you aren’t local, they will mail care packages out. If you know anyone who could use some love and hope, please connect them with the page. If you feel inclined to sponsor or help in any other way, please also connect with them. If absolutely nothing else, please pray for them as they reach out to others. September Is _______ Awareness Month!! If you turn on your computer, do a random search about causes, you’ll find it’s an awareness month for different things. This month, September is known to be a month to bring awareness to two very important things. You see, September is Childhood Cancer Awareness Month, but it is also Suicide Prevention and Awareness Month. What’s on my mind. Awareness. As you all know, or have come to read from my cover photo, September is Childhood Cancer Awareness month. Clearly, this is a cause near but not so dear to my heart. It affects so many people, our family included. I never, in a million years, saw myself making that statement. Let’s remember all those affected in some way, shape or form by this. Do what you can to raise awareness, and also to take action on behalf/honor of those who have lost battles, but also for those fighting, and those yet to fight this battle. Each child is precious. Something else on my mind is awareness for something else. Suicide. As you may know from previous cover photos and many status updates – suicide is also something not unfamiliar to me. Did you know that September is also Suicide Prevention Month. Suicide is something else that holds way too many statistics. As you know, this is another topic that is near but again, not so dear to my heart. What I can tell you is that suicide is a real problem, and is a problem needing to be talked about. We need to do our parts as individuals and as groups to erase the stigma attached to this. Mental illness is very real, and is no laughing matter. Again, something I’m familiar with. If you know someone who is struggling, do NOT let them struggle in silence. Don’t let them tell you they’re okay when you know they’re not. Don’t let that fake smile be enough to say they’re okay. Dig deeper. Grow friendships more than skin deep. Be the friend you need in others. No matter what your battle, or what you are struggling with, please KNOW that you are NOT alone. There is not a human being alive that needs to walk through life alone – through cancer, depression, etc. Don’t do it. Let others in. You are loved. Hope is real. That is EXACTLY how I feel. This life is full of so many uncertainties. Nothing is guaranteed, and tomorrow isn’t promised. However, no matter WHAT curveballs life throws your way – NEVER lose hope. You are absolutely NOT alone! If you’d like to connect and discuss either of these topics, you can feel free to contact me directly via “contact me” page, or you can post in comments. I look forward to continued dialog.